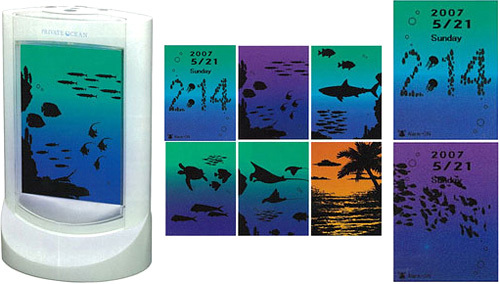 Sega Private Ocean Interactive Clock Is Nothing Like Being There | OhGizmo! Based on the product shots, I originally thought this Private Ocean interactive clock used one of those segmented LCD displays like you’d find on Tiger and Nintendo Game&Watch handhelds. But if you check out the video I’ve included after the jump, the display actually appears to be capable of full-motion animations, which is kind of cool even if they’re just monochrome. While it’s no substitute for actually being in the ocean, the clock does include a vast menagerie of undersea life that will either casually swim by, or dance along to the music if you connect an audio player. There’s of course a clock and calendar function, and the current time is cleverly displayed with a school of well organized fish. And if you find this type of thing relaxing, the Private Ocean has a multi-colored backlight for setting the mood, as well as a 15, 30 or 60 minute sleep timer if you happen to doze off. You can get it from Japan Trend Shop for $199.99. Ha, yeah. Maybe it could become virtual fishtank Thursdays.